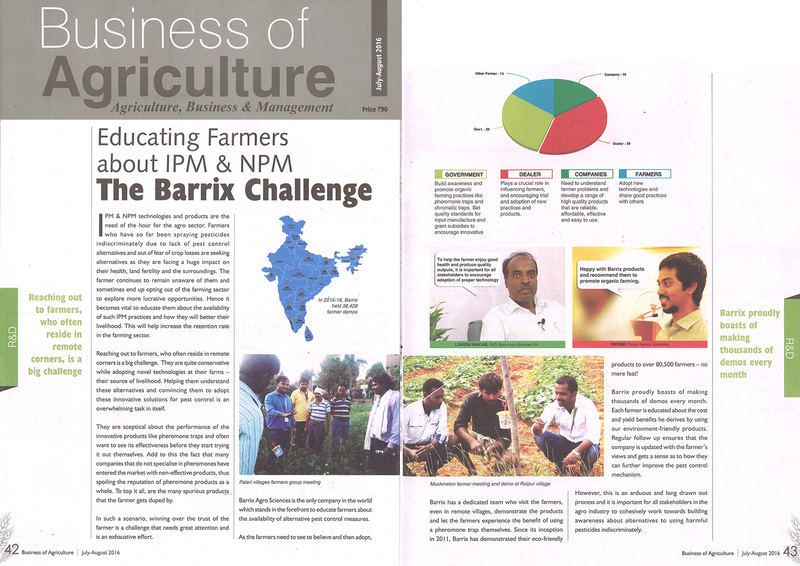 IPM & NPM technologies and products are the need of the hour for the agri sector. Farmers who have so far been spraying pesticides indiscriminately due to lack of pest control alternatives and out of fear of crop losses are seeking alternatives as they are facing a huge impact on their health, land fertility and the surroundings. The farmer continues to remain unaware of them and sometimes ends up opting out of the farming sector to explore more lucrative opportunities. Hence it becomes vital to educate them about theavailability of such IPM practices and how they will better their livelihood. This will help increase the retention rate in the farming sector. Reaching out to farmers, who often reside in remote corners, is a big challenge. They are quite conservative while adopting novel technologies at their farms – their source of livelihood. Helping them understand these alternatives and convincing them to adopt these innovative solutions for pest control is an overwhelming task in itself. They are skeptical about the performance of the innovative products like pheromone traps and often want to see its effectiveness before they start trying itout themselves. Add to this the fact that many companies who do not specialize in pheromones have entered the market with non-effective products, thus spoiling the reputation of pheromone products as a whole. To top it all, are the many spurious products that the farmer gets duped by. In such a scenario, winning over the trust of the farmer is a challenge that needs great attention and is an exhaustive effort. Barrix Agro Sciences is the only company in the world which stands in the forefront to educate farmers about the availability of alternative pest control measures. As the farmers need to see to believe and then adopt, Barrix has a dedicated team who visit the farmers, even in remote villages, demonstrate the products and let the farmers experience the benefit of using a pheromone trap themselves. Since itsinception in 2011, Barrix has demonstrated their eco-friendly products to over 80,500 farmers – no mere feat! Barrix proudly boasts of making thousands of demos every month. Each farmer is educated about the cost and yield benefits he derives by using our environment-friendly products. Regular follow up ensures that the company is updated with the farmer’s views and gets a sense as to how they can further improve the pest control mechanism. However, this is an arduous and long drawn out process and it is important for all stakeholders in the agri industry to cohesively work towards building awareness about alternatives to using harmful pesticides indiscriminately.